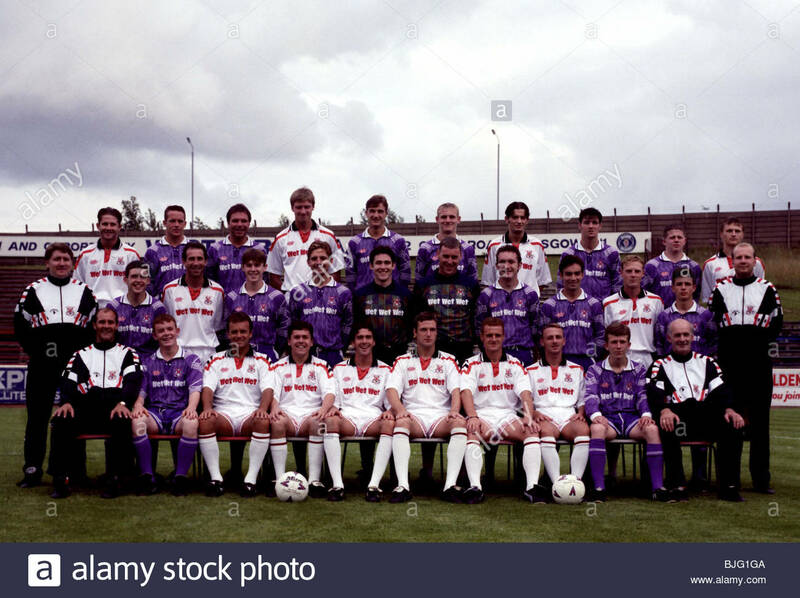 SEASON 1994/1995 CLYDEBANK Back row from left: Craig Flannigan, Johnny Walker, Paul Agnew, Tom Currie, Shaun Smith, Gary Teale, Gary Bowman, Colin Sutherland, Raymond Dunn and James Gray. Middre row from left: Peter Anderson (physio), David Hardie, Colin Harris, Derek Crawford, Steve Kerrigan, Alan Monaghan, Gary Mathews, Edward Conville, Graeme Ferguson, John Henry, Frank Petrucci and Peter Saila (physio). Front row from left: Brian Wright (coach), Ryan Robertson, Davie Cooper, Scott Murdoch, Paul Jack, Sean Sweeney, Ken Eadie, Alan Lansdowne, Barry McLaughlan and Jim Gallagher (coach).